Also known as a Communard (with Beaujolais wine), the Cardinal wine cocktail is a French apéritif from Burgundy, France. It is a fresh and short drink that can be enjoyed at any time during the day… though a few exceptions might apply. Reminiscent of the Kir and its more salubrious cousin Kir Royal, the Cardinal wine cocktail is using red wine (light Pinot Noir) as opposed to white or Champagne. • Wine glass – In terms of glassware, the glass you use is really a personal choice. However, a Cardinal is typically served in a regular small wine glass. The “normal” size for this cocktail should be around 5-6 ounces. This gives everyone a chance for seconds, which is normal for a traditional apéritif session! • Crème de cassis (1/5) – Crème de cassis (blackcurrant liqueur) is a little thicker and heavier than the wine and it will sink to the bottom of the glass if you pour it after the wine. Make sure to pour the crème de cassis first and the wine second. The wine will mix both liquids together as it is poured. L’Héritier-Guyot (from Côte d’Or, France) is one of the most widely distributed brands available in the United States. • Red wine (4/5) – A light Pinot Noir. I always recommend using ingredients that come for the same region as the recipe. Since the drink originated in Burgundy, I use Pinot Noir. However, A Beaujolais (Gamay) or light red from the loire region is another option. In that case, it is called a Communard. Those two varietals are my preference. You can vary the wine varietal, but it is important to choose a dry, high-acid, unoaked and non-aromatic wine, to complement the delicious sweetness of the blackcurrant liqueur. Fairly simple and relatively inexpensive wines work best. Leftover wine is also a great candidate for this recipe. 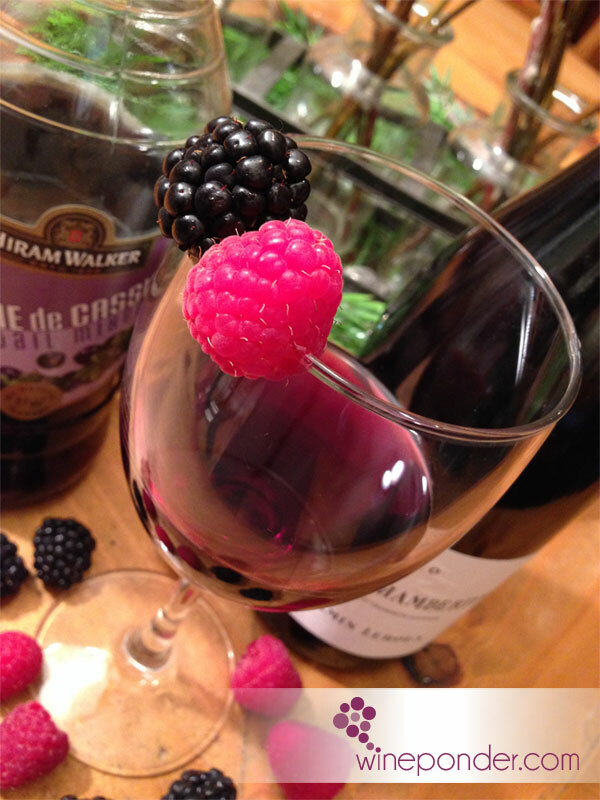 • Blackberries (2 to 3 per glass) – Use blackberries as garnish. You may place them on the rim of the glass, or use a cocktail skewer. If you’re feeling creative, you can even mix additional types of berries, such as raspberries and blueberries. Contrary to popular belief, a Cardinal wine cocktail shouldn’t be very sweet. The perfect combination should result in a drink that is a crisp, refreshing, with a delicate blackcurrant flavor and only slightly sweet – just sweet enough to take the edge off the wine’s acidity, but not seem syrupy. Too much liqueur addition destroys the necessary freshness to work as an apéritif and makes the drink too sweet and alcoholic. The International Bartenders Association gives a recipe using 1/10 crème de cassis, but French sources typically specify more; 19th century recipes for blanc-cassis recommended 1/3 crème de cassis, and modern sources typically about 1/5. Well, after trying those myself, I found that 1/5 is the right ratio for my taste. The name of this cocktail remains a bit if a mystery, though some say that its dark rich red color reminds them of a warm plush Cardinal’s robe. Every time we go to back to France, we always visit my mother-in-law. She lives in Pontarlier, a small town about 15 kilometers from Switzerland. 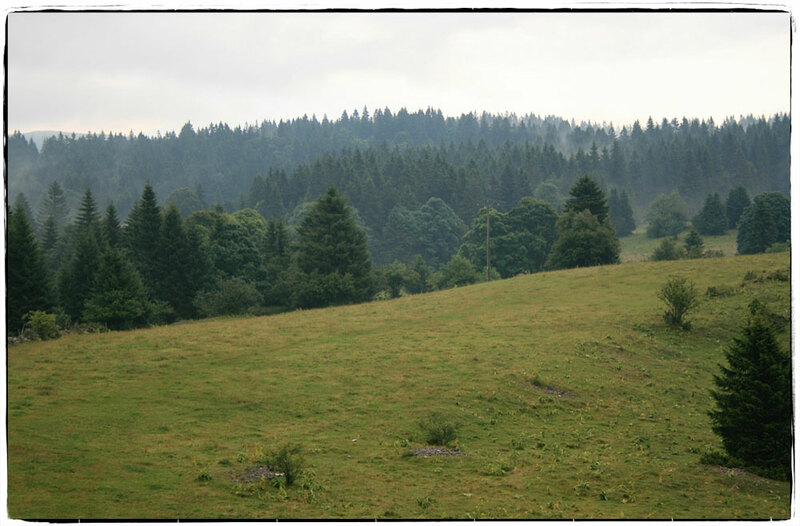 Our family tradition is to go to a restaurant called “La Boissaude”, located in the high mountains of this beautiful region called Haut-Doubs, home of the oh-so-delicious Comté cheese and Absynthe. Only 3 kilometers away from the Swiss border, the restaurant is surrounded by nature and completely isolated from urban life. All you see are hills covered with green grass and happy cows, practically free to roam wherever their appetite takes them. 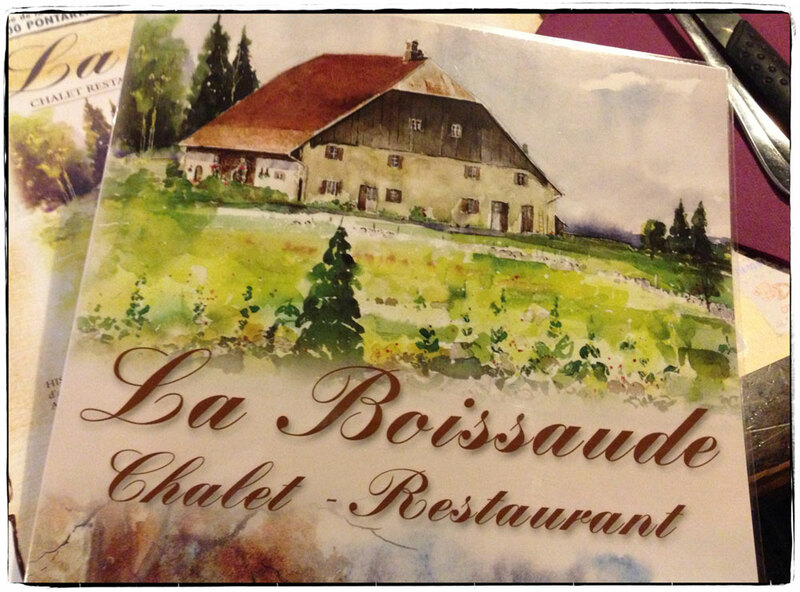 La Boissaude used to be a dairy farm and became a restaurant many years ago. Locals know it well and so do we. I personally go there for the delicious food but also for their cocktails… one in particular. They make a Cardinal cocktail like no other. Their secret: they use “liqueur de mûre” – blackberry liqueur instead of the traditional blackcurrant liqueur. BIG difference, and with all due respect to my fellow friends from Burgundy, I prefer the Boissaude version of the cocktail a little bit more. I serve both versions to my guests and it is always interesting to hear their reactions and comments as to which one they prefer and why. You too should try and let me know what you think. Santé! Thank you so much for the new address in the Haut-Doubs. We will have to experiment… And thank you for these interesting informations. Sincerely. I figured I’d leave this here: The name Communard comes from the Paris Commune. In march of 1871, communists and anarchists revolted and turned Paris into an independent commune. The drink is sometimes called a Communard because the communist (reds) and anarchists (black) working together were called communards, just as the red wine and blackcurrant liqueur come together to make this drink. This is amazing! Thanks for sharing this with us, Daye!